This post is part of my personal portfolio – to illustrate my requirement writing, problem solving and analytical skills. 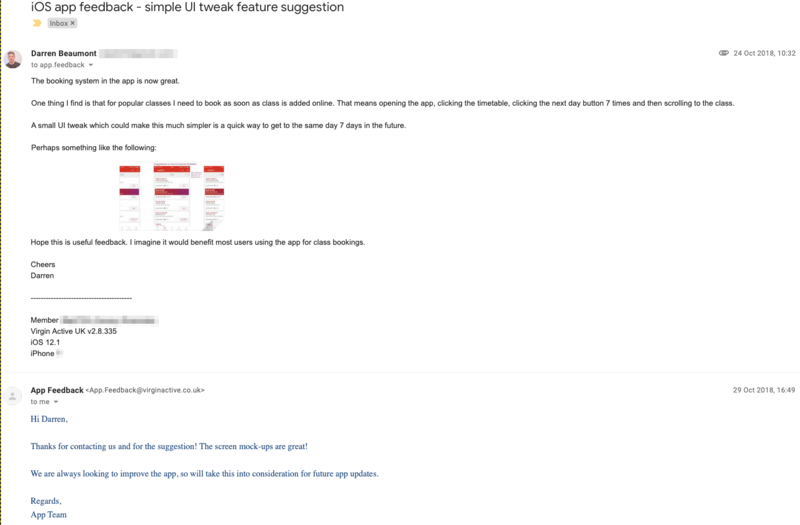 On the right hand side is a real example I shared via my gym provider’s app – suggesting a small user experience (UX) tweak that could be save a lot of users micro-amounts of time each week – thus simplifying the experience of repeat actions. Below I give a more detailed case study of how the Virgin Active product team could take this feedback and turn it into a practical requirement – assessing its validity to implement. Gym classes are bookable via the Virgin Active gym app 7 days in advance. Once a gym class is full a waiting list is maintained. Many members who attend classes regularly tend to book busy classes as soon as they become available – i.e. 7 days in advance. For popular classes it is not uncommon for the class to be fully booked in the first 8-12 hours of booking release. 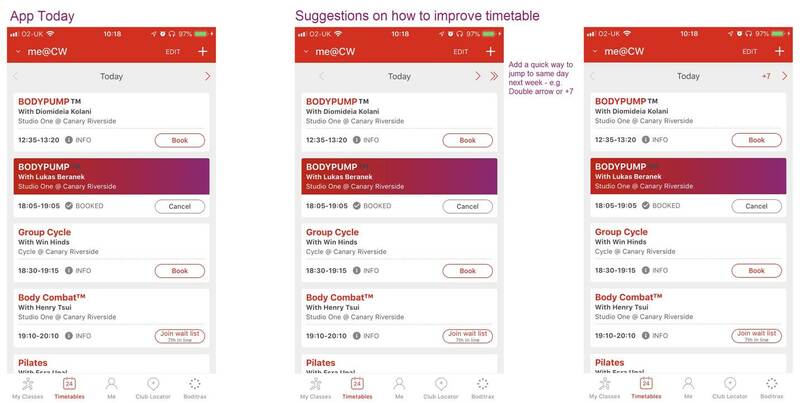 To complete the booking task today the member must open the app on their phone, click the timetable tab, click the next day button 7 times and then scroll to the class and click book. A small UI tweak which could make this much simpler is a quick way to get to the same day 7 days in the future. There are many ways to solve this problem – including personalisation within the app to book classes you attend regularly, or a way to rebook the next instance of a past classes on the upcoming time slot of same day and time. Below however I focus on a minor UI tweak to the apps existing class calendar booking feature. I then assess its impact to see whether the cost to implement is worth the benefits returned. We can perform timing test to quantify the benefit. Once the calendar is loaded on the app it takes on average 3.525 seconds to click the next day button seven times to reach the next day. This number is calculated based on experimentation by timing the activity 20 times and taking an average. This is best case average time – with many users would being slower to perform the task. Thus on average scrolling through each day takes 0.5 to click and load the next day’s content. If we have a single button advancing us to the day classes have just been released (i.e. +7 days) then the average time to click would be 0.5 seconds (= 3.525/7). In the best case when users book as soon as classes are released this feature would save each user who used the new feature 3 seconds per advance (+7 day) class booking. Based on my local gym, let’s estimate the average gym club has 100 classes per week with capacity of 30 people per class. Assuming each class is full (which is fair given some classes will be under capacity, with others oversubscribed) then there are 3,000 (=100*30) people booking classes per week. If 50% of people book next weeks class the day availability is released, then we have 1,500 people per club per week who would benefit from this new feature. With 43 clubs across the UK, this small UI tweak could be used by over 64,500 class bookings per week (=1,500*43) – over 3.35mil per year (=64,500*52). This new feature could save members a collective 116 days per year (= (3.35mil * 3 seconds) / 60 seconds in a minute / 60 minutes in a minute / 24 hours in a day). So whilst for each individual user a saving of 3 seconds may seem inconsequential, the saving quickly adds up over repeated use. Sometimes its the small UI tweaks that can provide an enriched experience. Posted in Uncategorized, User Experience Design and tagged design, improvements, portfolio, requirements, usability, use cases, ux.